Mizoram Board of School Education (MBSE) chuan niminpiah April 25, 2014 khan kumin a High School Leaving Certificate Examnination (HSLC) result a tichhuak a, Mizoram pumah zirlai za zela 67.51 ten pass in kum 2013-a pass 58.63% aiin kumin hian pass an \ha zawk a ni. zirlai 429 awmin, 1st Division a pass 1955 an awm a, 2nd Division a pass 3569 leh 3rd Division a pass 6515 an awm a, compartmental chance la nei zirlai 387 la awmin, failed zawng zawng hi 5614 an ni. Kumin a HSLC Exam result tihchhuah ah hian Top-10 ah mi 19 langin a pumpuiah Lalremruati Sailo d/o Lalhruailiana Sailo, St. Pauls's Higher Secondary School leh Malsawmzuala Royte, St. Peter's HSS, Chhingchhip te chu pakhatna an ni. Kumin 2014 HSLC result tihchhuah ah hian zirlai exam zawng zawng pass vekna (100% passed) school 154 an awm laiin, passed awmlohna school (100% failed) school 8 a awm a, 60% chin chunglam pass School 55 awmin, 99% a\anga 41% passed hi School 381 zet an awm a ni. A pumpui ah St. Paul's Higher Secondary school chu ti\ha ber niin, zirlai exam zawng zawng 308 an neih te an pass vek a, top-10 ah mi 8 an school a\ang hian an nei bawk. School Category hrang hrang zingah Deficit school te an ti\ha ber a, Deficit school hrang hranga a\anga pass percentage chu 92.97 a tling phak a, hetihlai hian private a exam beitu zirlai 5634 te pass percentage chu 30.69 chauh a ni. Sorkar enkawl school te pass percentage chu 75.64 niin, Aided School te pass percentage chu 80.78 a ni a, Lumpsum school te pass percentage pawh 78.85 tlingin, Private school te pass percentage chu 85.66 a ni. 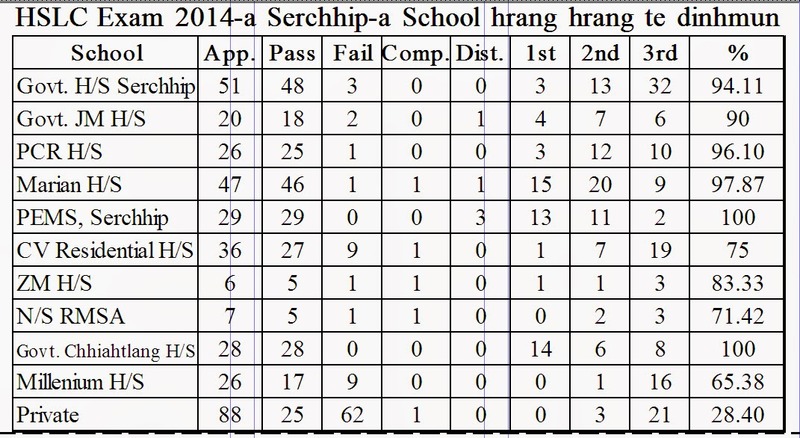 District hrang hrang zingah Aizawl District chu passed \ha berin 84.91% an pass a, Champhai District-ah 82.54%, Kolasib District-ah 75.34%, Lawngtlai District-ah 75.34%, Lunglei District-ah 77.92%, Mamit District-ah 72.68%, Saiha District-ah 83.69% leh Serchhip District-ah 83.39% an pass a ni. Tun \uma HSLC Exam result tihchhuah ah hian Hmeichhia (66.43%) aiin Mipa (68.64%) an passed \ha zawk a ni.